Description Basketball shoot. you have 30 seconds to make 10 baskets in each round. 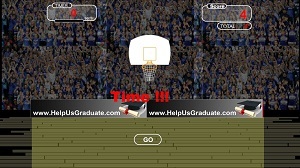 Controls Use your mouse and click to hold the ball. Release mouse button to throw ball. Go through 3 increasing difficulty levels.